Prickly pear cactus (Opuntia spp.) 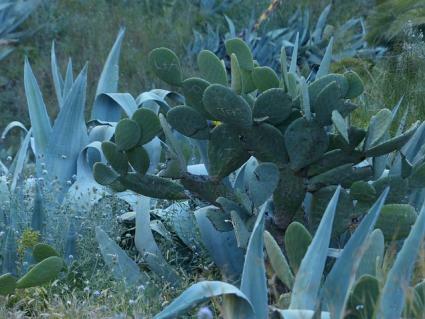 is one of the most cold hardy, adaptable, and easy-to-grow types of cactus. 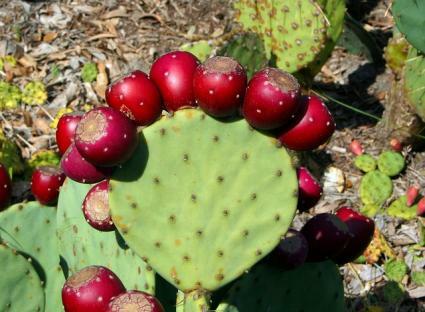 Plus, its leaves (the cactus pads) and fruits are edible and are often used in Mexican cuisine. Prickly pear cactus has large flat leaves, which are actually a modified portion of the stem of the plants, that are often referred to as cactus pads. The pads are typically about one inch thick and six to 12 inches in length with an oblong, rounded shape. These are covered in large spines though spineless varieties are available. 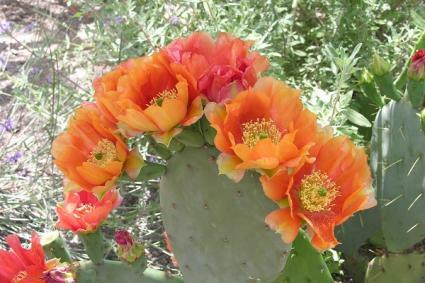 Bright red, orange, or yellow flowers appear in early summer along the outer edges of the pad near the top of the cactus. The flowers are two to three inches long and quite showy with a cup-like shape and frilly petals. These are followed by two to three inch oblong fruit in late summer with a deep purplish-red color - these are also quite attractive as well as being edible. The fruit is often seen in Mexican markets and are called tunas in Spanish. Growth habit is quite varied depending on the variety from plants that spread along the ground just six inches tall to tree-like forms that grow 16 feet tall. While most cacti are hard to grow outside of arid regions, prickly pears are found in nature throughout much of North America and are widely adapted to climate and soil type. Depending on the variety, they can be grown in USDA zones 4 to 10 and will grow in any soil as long as drainage is good. However, they thrive in sandy or rocky soils, where few other plants survive. They need no irrigation and are one of the few plants that can honestly be called 'maintenance free'. The only pest you will encounter is a type of scale insect called cochineal, which appear as a whitish fuzz on the pads. The plants coexist with this pest without suffering ill health, however, and the tiny bugs are actually a traditional source of red dye, which is still used as food coloring. Prickly pears fit well with desert, southwestern or Mediterranean themed plantings, but look a bit awkward in the average flowerbed. That being said, they have such a striking and unusual appearance that they can be used to make a bold artistic statement in the garden! Wherever they are planted, it should be well away from paths or other places frequented by people and pets because of their large spines. They are the perfect plant for landscaping a rock outcropping where nothing else will grow. The varieties with an upright growth habit are also used as a living fence since a hedge made of prickly pear is impassable to intruders. Their only requirements are full sun and good drainage. Prickly pear is not widely available in nurseries outside of arid regions, but CactusStore.com offers numerous varieties online. Prairie Moon Nursery is a good source for the most cold hardy type of prickly pear, which can even be grown in southern Canada. Make sure to wear thick leather gloves and protective clothing when handling the plants. Space them about three feet apart for hedge plantings. Prickly pears are also incredible easy to propagate. If you have access to a mature plant, simply cut off one of the pads and lay it (unburied) on the ground where you want it to grow - within a few months it will form roots and start to grow. You could even go to a Mexican food market and buy some of the pads that are sold for cooking for use as propagation material. The fruit is ripe in late summer when it is a deep red color and becomes soft to the touch. The pads, which are used as a vegetable, should be harvested when tender and light green. These are the newest pads that appear on the outer portions of the plant throughout the growing season. Avoid the older, darker green pads. Ideally, the thornless varieties are grown when the intent is to harvest prickly pears for food. If not, be sure to wear gloves when handling and pull or cut off the large thorns before serving. There are also tiny hairs on the fruit and pads that are an irritant when touched or eaten though these can be scraped off under running water while wearing rubber gloves. 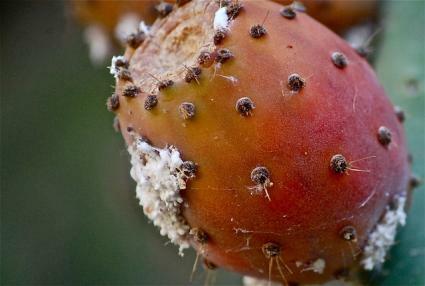 Prickly pears vary tremendously in size, growth habit, coloration, and other qualities. 'Purple' (Opuntia rufida) grows six feet tall and has a purplish cast to the pads; it's hardy in USDA zones 8b-10. 'Albaspina' (Opuntia microdasys) grows two feet tall and has tiny clusters of white spines that look like polka dots; it is hardy in USDA zones 9-10. Opuntia humifusa, also know by its common name Eastern Prickly Pear, grows as a six-inch sprawling groundcover; it is hardy in USDA zones 4-9. 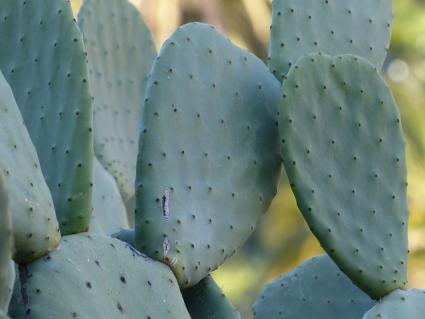 'Burbank Spineless' (Opuntia ficus-indica) grows to 12 feet and is a popular spineless variety for eating; USDA zones 9-10 is where it's hardy. Prickly pears are quite a conversation piece in the garden. Try them out as an ornamental or for the adventurous eaters out there, consider sampling the fruit and edible pads.